I have yet to meet a person that doesn’t enjoy Reese’s peanut butter eggs, trees, or pumpkins (can you tell how much I love these?!?). For me personally, they are my favorite holiday treat, and I buy tons of them as soon as they hit the store shelves. I think my favorite shape is probably the tree, because it offers the optimal peanut butter to chocolate ratio. Unfortunately, not everyone can enjoy them because of food allergies, sensitivities, and dietary preferences. SO, I wanted to fix that, and create a version that everyone can enjoy (well, as long as you aren’t keto, paleo, or whole30). It is my unbiased opinion 😉 that everyone should have the opportunity to be able to enjoy these delicious treats. 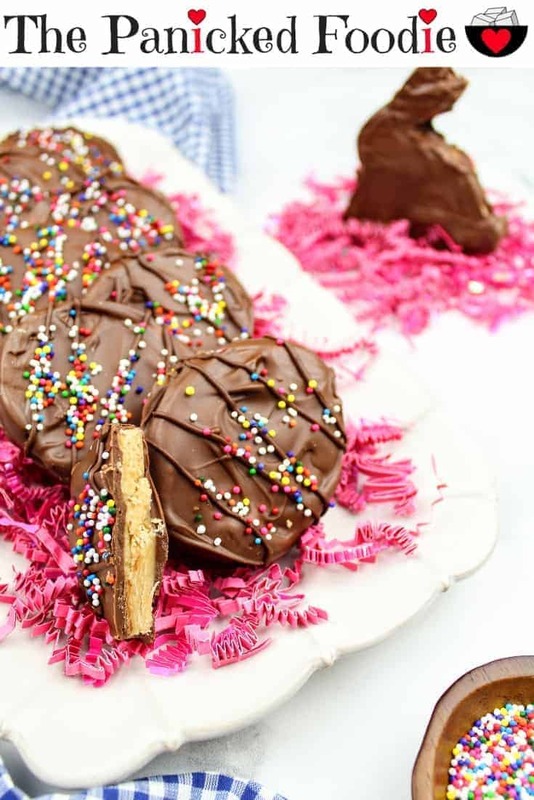 For this recipe, I decided to use my old standby chocolate peanut butter ball recipe, and shape them into various Easter shapes using cookie cutters. When taking a bite, you get that satisfying snap of the chocolate, and the smooth creaminess of the peanut butter filling. Feel free to adapt this recipe and use whatever cookie cutter shapes you want! Can you freeze homemade vegan peanut butter eggs? Yes! Like the peanut butter balls, vegan peanut butter eggs can be frozen. Although to be honest, unless you make a ton of them, they will be eaten before even making it to the freezer! They keep in the freezer for up to 3 months. My dough is a little crumbly, how do I fix this? This might happen, depending on how you measure your confectioner’s sugar. I explain how to fix this problem in step 1 below, but the short answer is to add a little more of your favorite milk alternative (or milk). My dough is too sticky, how do I fix this? If this happens, add a little more confectioner’s sugar (see step 1 below). 1. In a medium sized bowl, mix confectioner’s sugar, butter of your choice, milk of your choice, and vanilla extract with your hands until a soft dough forms. 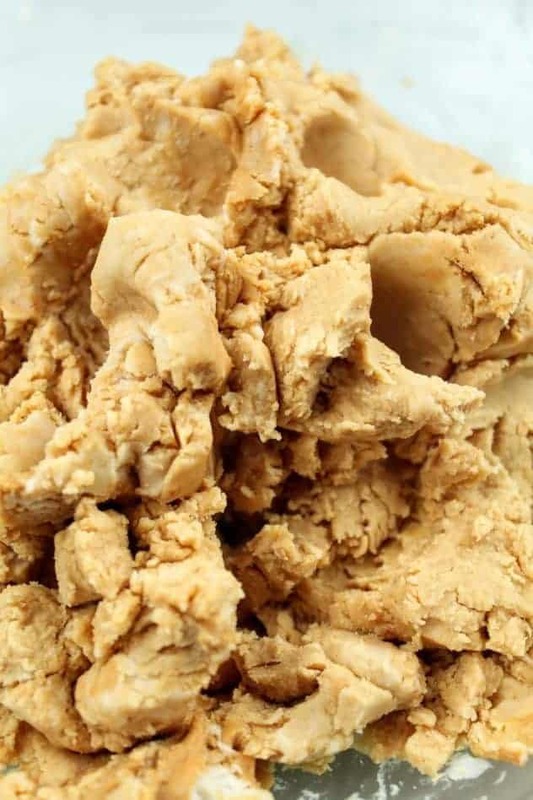 The dough should not be crumbly and it should not be sticky. It should have a slight luster on the outside and feel like playdough as you mash your fingers through it. If the dough is too dry from adding too much confectioner’s sugar, add 1/4 teaspoon milk of your choice, and mix the dough with your hands to incorporate. Keep repeating this process until the right dough consistency is achieved. If your dough is too wet, add in confectioner’s sugar 1 tablespoon at a time, and mix the dough with your hands to incorporate. Keep repeating this process until the right dough consistency is achieved. 2. Mix in the peanut butter with your hands. 3. Line a baking sheet with wax paper, and transfer the dough from the mixing bowl to the lined baking sheet. Flatten the dough out with your hands, then use a rolling pin to roll it out to ~1/2 inch thickness. Using cookie cutters, cut shapes out of the dough. A word of caution here: the more complicated the shape, the harder it will be to coat with chocolate. Eggs are really easy to do, but bunnies and carrots with fine details are very hard to coat, especially the corners. I tried painting them with a brush, using a spoon to slather it on, and dipping, and the result wasn’t all that good. If aesthetics aren’t important, then go for it! 🙂 I just wanted to give a little heads-up, so that people are aware that complicated shapes might not come out as nice as the eggs. One thing I didn’t try, was thinning out the chocolate more with shortening so that it was more liquid-y. This might eliminate the webbing between the sharply curved details, after dipping them. After making the first round of cutouts, transfer them to another wax paper lined baking sheet. Repeat the process of rolling out the dough and making cutouts until there’s not enough dough to make a cutout. Since wasting food is a major no-no, you will have to eat the scraps :). Place the baking sheet with the cutouts into the refrigerator to chill and firm up for 15-20 minutes. 4. In a glass Pyrex measuring cup, measure out chocolate chips and add in shortening. Microwave according to package directions. You should have a smooth and velvety chocolate sauce. 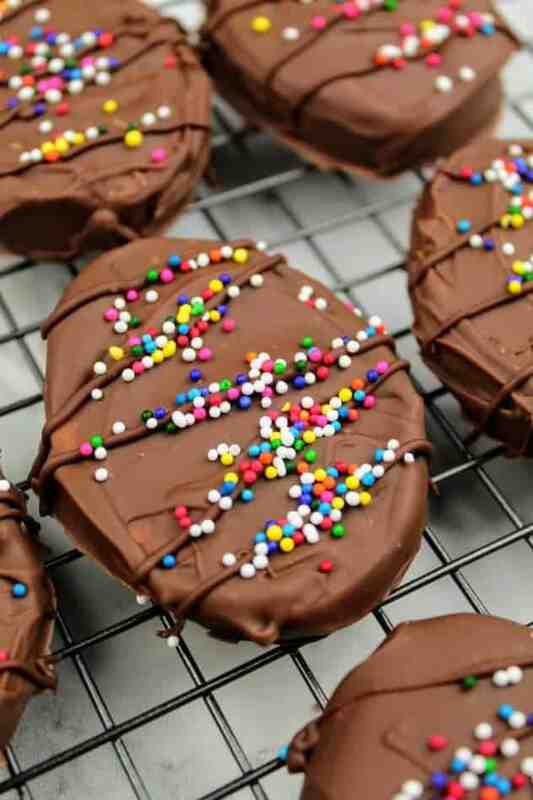 Remove the cutouts from the refrigerator and coat them with chocolate. I coated mine using the following process. First, I used a spoon to place a dollop of chocolate on the cut out, and then used the back of the spoon to smooth it out. You have to work fast here, because the chocolate sets fast. Then after covering the top of the shape, I dipped the spoon back into the chocolate to get a little bit more, and used the spoon to coat the sides of the shape. Then I placed the cutouts back in the fridge for 15 minutes to finish setting the chocolate. After the chocolate hardens, remove the cutouts from the fridge, flip them over, and coat the other side. Place the cutouts back in the refrigerator to harden for another 15 minutes. If you want to add sprinkles to the entire top of the egg, you’ll want to add those right after you coat the egg with chocolate (can do this on either side). If you want a drizzle like I used in the photo, you will need to add that after the chocolate on the egg is completely hardened. After drizzling the egg, promptly cover with sprinkles. 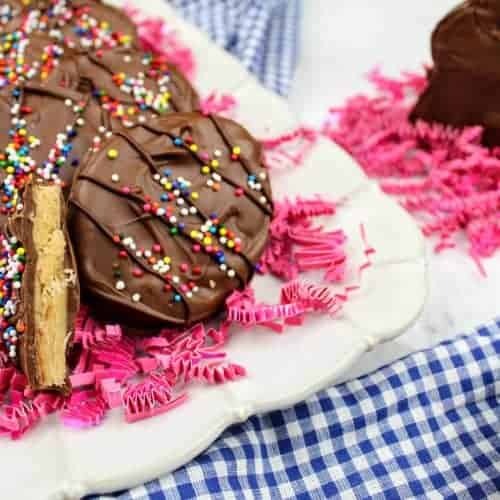 These vegan and gluten-free peanut butter eggs are the perfect Easter treat or Easter basket filler! Elegant, yet easy to make! Serve with a tall, cold glass of milk of your choice. 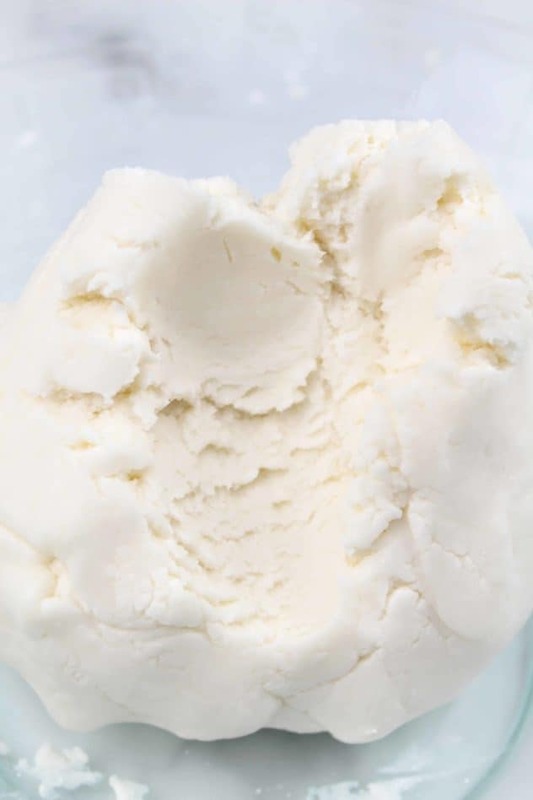 In a medium sized bowl, mix confectioner’s sugar, milk of your choice, butter of your choice, and vanilla extract with your hands until a soft dough forms. Mix in peanut butter with your hands. On a wax lined baking sheet, roll out dough to 1/2 inch thickness. 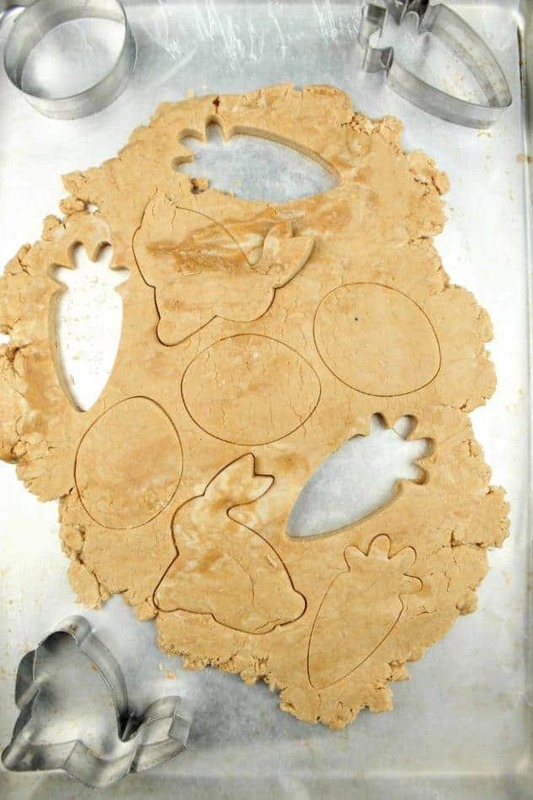 Cut dough into shapes using any type of cookie cutter. Transfer cutouts to a wax lined baking sheet. Refrigerate for 15 minutes. While cutouts are chilling, measure out the chocolate chips using a glass Pyrex measuring cup and add the shortening. Microwave according to package directions. Remove cutouts from the refrigerator, and coat with chocolate using the backside of a spoon. If desired, top with sprinkles. After cutouts are coated, return them to refrigerator for 15 minutes, or until chocolate is set. Store in an airtight container in the refrigerator for up to two weeks, or in the freezer for up to 3 months. The number of servings is dependent on how large your cookie cutters are, and the thickness of your dough after rolling it out. A thinly rolled dough will yield more servings and a thickly rolled dough will yield less servings. And the number of servings will consequently affect the calories per serving. The total calories based on the brands I used was 3,216 calories. So take this number, divide it by the number of cutouts, and this is roughly the calories per cutout. Oh wow! I have to make these for my mom! She is lactose intolerant so they would be perfect for her! YASSS!!! 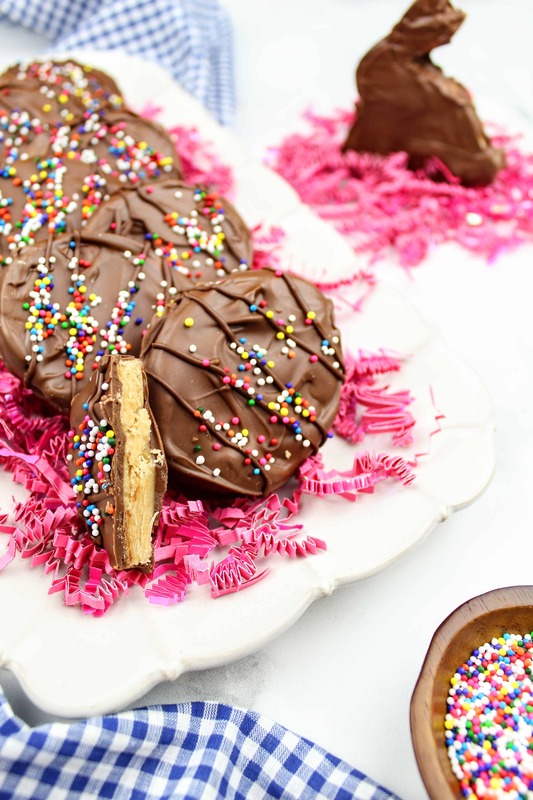 I love a good peanut butter cup and these homemade ones are gorgeous. I’ll take 2! These peanut butter eggs are so good for Easter. Delicious recipe that are just perfect to have around Holidays. And I love the fact that they can be frozen – so handy.